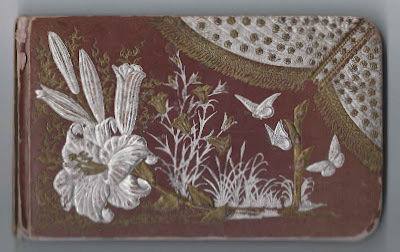 1880s autograph album that may have belonged to Lucy Etta Friend of Sedgwick, Maine, and Portland, Maine. 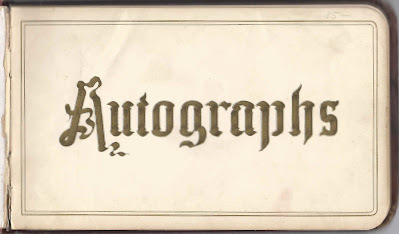 The first signed page in the album was signed by Lucy E. Friend. 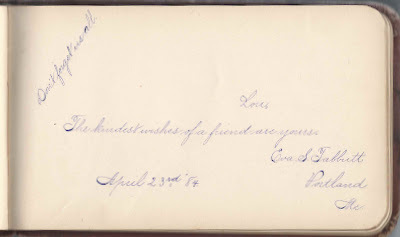 Presumably she was the owner, but I can't be sure of that, although one signer referred to her as Lou, and Lucy Etta Friend eventually left Sedgwick, Maine, for Portland, Maine, where all but one of the pages were signed. 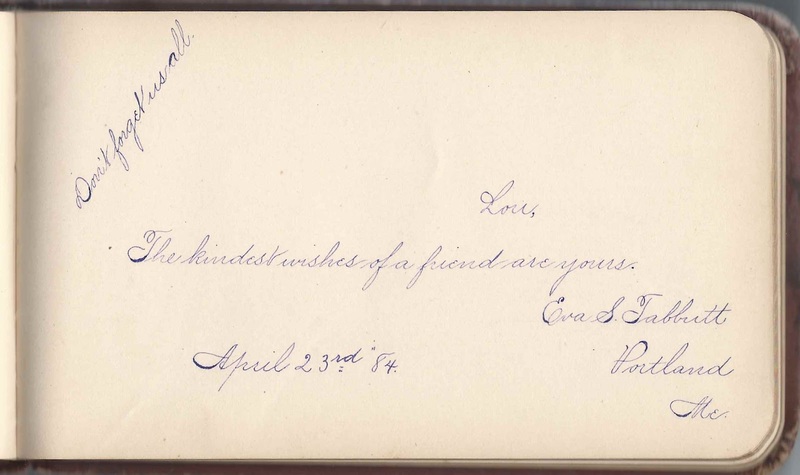 The signer who inscribed her page to "Lou" was Eva S. Tabbutt of Portland, Maine, who signed a page on April 23, 1884. 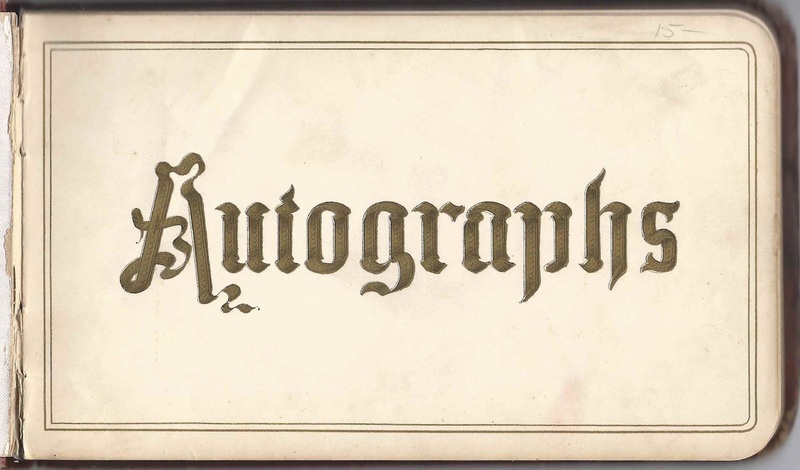 The album is approximately 7" x 4-1/4" and contains only 8 signed pages. An alphabetical list of the signers appears at the end of this post. Lucy Etta Friend was born 7 January 1868 at Sedgwick, Maine, the daughter of John W. and Clarissa N. (Bridges) Friend, who were both born at Sedgwick, Maine, I believe. 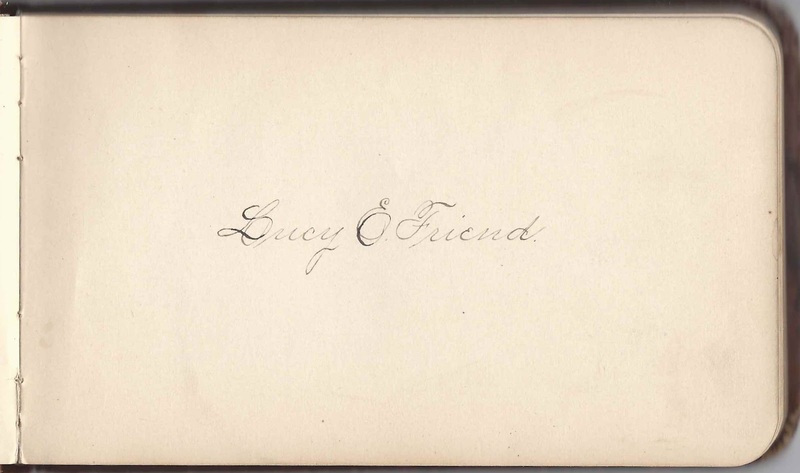 On 25 December 1886 at Portland, Maine, Lucy Etta Friend married William H. Homan, son of Elihu and Lucy P. (Marston) Homan of Portland. William was born at Portland, Maine, on 29 June 1857. Lucy Etta and William had five children, three of whom died young, though Lucy was spared the grief, as she had died before them, in 1895 of consumption. William and his sons had a painting business. If you have access to Ancestry.com, someone has uploaded two photographs of Lucy Etta Friend, which you can access by searching for her. That person also noted that Lucy's sister Blanche helped take care of the children in the summers after Lucy's death. If you have corrections to the information above, if you feel that the album belonged to a different person, or if you have information on any of the signers listed below, please leave a comment or contact me directly. Thanks! Sedgwick, Maine [A] and Portland, Maine [B] You may have to zoom out a click or two.